The sweetest and softest variety compared to other lentils, making them perfect for Indian dal. As the softest lentilvariety, these tend to turn mushy when cooked, which makes them the ideal option for Indian dal and soups. 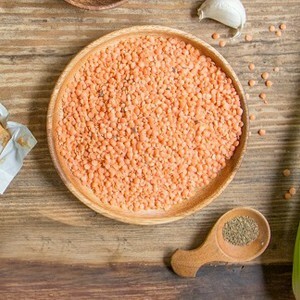 Red lentils actually range in color from red to orange to gold. They can be listed as channa (yellow lentils) or masoor (red lentils).Lentils, members of the legume family, are grown in pods of one to two seeds. They are known for their high level of nutrition benefits- most notably, lentils are rich in fiber. Fiber helps lower cholesterol levels and also manage blood sugar. Lentils additionally have significant levels of seven B-vitamins and are high in protein. There are several different lentil varieties, but nearly all are hearty and nutty in flavor.